‘Rolling in dough’ is an old American slang expression for having lots of money, wealth. Some people think having a lot of money is the way to all good things and happiness. Dough can be a flour mixture used to make all kinds of good foods to eat. You roll out dough to make bread and pastries, even pasta. Making this kind of dough can be very satisfying and worthwhile. My mother had the knack for making the dough for pie crust. You need to develop a feel for the right consistency when mixing the ingredients and not handle the dough too much otherwise it will come out tough. Hers came out tender and flaky, just right. It’s a talent, a skill. Some people have been rolling their dough all wrong to get their kids into college and their recipes have fallen flat. Stream of Consciousness Saturday, #SOCS, is hosted by Linda G Hill. Today’s prompt is “dough/d’oh.” Use one, use both, use ’em any way you like. Enjoy! This entry was posted in Blogging, Blogging Community and tagged #Stream of Consciousness Saturday, SOCS on March 29, 2019 by Deborah Drucker. I agree, there is a definite art to making pie crust flaky! And I still can’t make it like my mother did. My grandma had the skill for making pie crusts too. There’s definitely a technique to it. Great memories. So true, all of it. My mother made wonderful pies with tender crusts. She taught my sister and I and we’ve been rolling pie crust since we were kids. You’re right, it’s a skill. Once, many years ago I was in a hurry and bought some of that pie crust from the grocery store that comes already rolled. I made the pie and took it to my mother-in-law’s dinner. She took one bite, looked at me and said “This is NOT your pie crust.” I laughed but was embarrassed. Never did that again. It took me a good 20 years to successfully make my mother’s pie crust. Now that I can, I take such pleasure in it. I have not attempted it yet. That is great you persevered and conquered. My mother used Crisco shortening which I don’t even know if you can get any more and all that about being unhealthy. 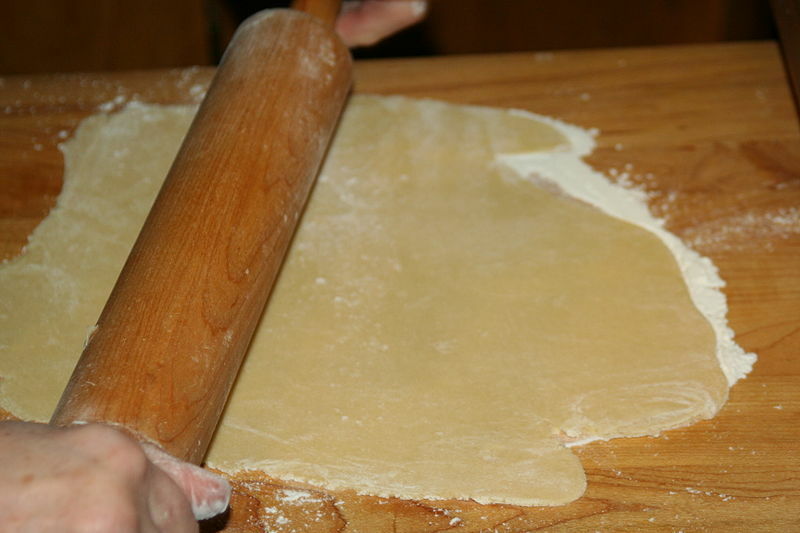 The image of handling or rolling dough appeals to me. It’s the making something with your own hands I think.